Our annual trip to Ohio has been occurring for almost as long as we’ve lived on the East Coast. For nearly 20 years, I’ve made the trip home during the same two week time frame in July, give or take a few days. The beauty of Time Hop? You can see what you were doing for the past five years, thanks to social media, and for the past week, it’s been a rehash of the trips home. Pictures from wine-fueled trips down memory lane with my sisters. Posts about a great game of Scatagories. Tweets about something only one other person will “get.” I’m pretty sure that when I look back next year, the days will be filled with images of Lucy and Maggie. You never know how two dogs are going to be until you put them in the same room with one another. Luckily for us, these two pups became fast friends. When we first got Lucy in January of 2013, we didn’t know what to expect. Our first peek at her was on Pet Finder, but what can you really tell from a photo of a puppy other than her color and the tilt of her head. Even after I talked to her foster mom, her temperament and behavior didn’t become any clearer because, well, she was a puppy. She liked to play. She got along well with the other dogs and puppies in the foster home. She was most likely a beagle/Lab mix. And that’s about it. Luckily for us, Lucy turned out to be a happy-go-lucky puppy with a few minor quirks. She’s very anxious, which makes for some rather interesting situations. She’s very used to sleeping on the couch or chair, so any new situation where she can’t sleep on the furniture makes her rather tense. Couple that with her being a food whore (and really, who can blame her . . . she’s my dog! ), and dinner time can be challenging because she’s intent on finding every last crumb to be had. It’s rather challenging to get them to both look at you and sit still. Thankfully, Lucy’s anxiety does not extend to other dogs. She’s pretty good with them when she meets them if we are on a walk. And she’s done well with my friend’s two dogs at her house. 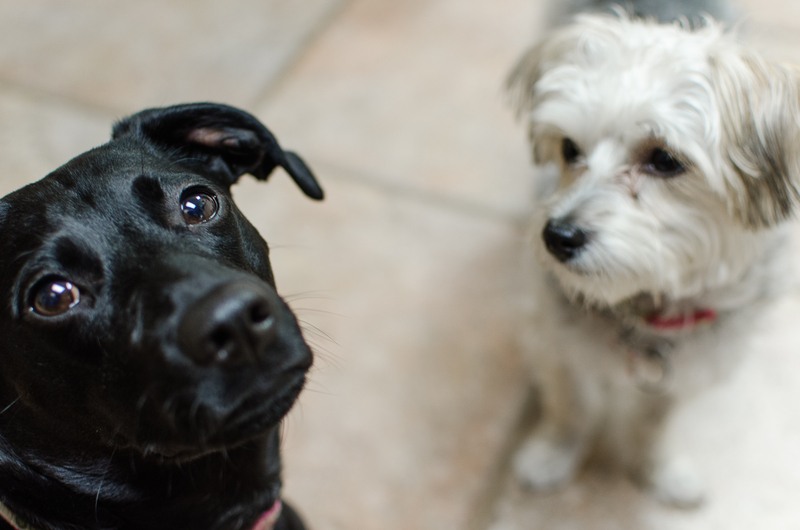 When she met Maggie, my sister Bridget’s dog, Lucy wasn’t too sure at first. Here was this little bouncing dog that immediately jumped up to her face and tried to lick her constantly. They chased each other non-stop, and Maggie quickly learned that if Lucy got a bit too aggressive that she could weave between the humans’ legs where Lucy couldn’t go. Both of them had antlers to chew on, but the apparently the other one’s antler tasted better. They repeated this dance of play all day long and only took breaks long enough to squeeze into the smallest section available on a chair to nap. I decided to take them for a walk together the second night we were home. At first, I thought I might have to turn around because Maggie wanted to kiss Lucy as she walked, and Lucy wasn’t having any of that. So the first few houses were rather tense. But eventually, the two of them fell into a comfortable pattern and walked the rest of the way as a team. When we got home, they spent the next half hour or so following each other around before finding someplace to settle down for a few hours. For me, this was a trial run because I really want to get another dog. Ideally, I’d like to find a small dog like Maggie to bring into our home. Dave says that it will have to wait until we are “cat free,” and I think that day is fast approaching. Shelby swears that Olive will come live with her once she and Lucas have a place that will allow cats. And Gilly – sweet, bitchy-faced, Gilly – is nothing but skin and bones at the ripe old age of 19; granted, she could live for another three or four years, but I don’t think she will. Until that time comes, I’ll keep looking at Pet Finder, searching for the perfect companion to my seat-stealing Lucy.